One of the many detailed displays in the Museum of Innocence. I get a strange feeling as I climb the hill toward Çukurcuma, the kind you get when you visit someone you haven’t seen in years or a distant relative that you know all about but have never met. As I walk along the streets of Istanbul’s antiques district, where chic cafés and cocktail bars draw a fashionable clientele, I imagine a love sick soul weaving his way between the backgammon players, with their heads bent intently over their boards, as he searches madly for the woman he loves. I am on my way to The Museum of Innocence, Nobel Prize-winning author Orhan Pamuk’s monument to a love affair and the subject of his 2008 novel of the same name. My intense feelings of déjà vu can be explained by my own literary travel through the streets of Istanbul courtesy of Pamuk’s sweeping descriptions of his home town. While it would be easy to assume that the museum is an offshoot of a successful novel, The Museum of Innocence is more complex than that. Pamuk developed the idea for the novel and the museum in parallel, effectively blurring the lines between the two. He started collecting items for the museum in the 1990s, searching junk shops and friend’s homes for ideas. Some of the curios he found inspired stories, while other ideas sent him looking for objects to fit existing stories. He describes the years he put the museum together as “the happiest experience of my life”; quite a claim from an author with so many prizes to his credit. The story is that of wealthy 32-year-old Kemal Basmaci who falls in love with his 18-year-old distant relative, Füsun Keskin, despite being engaged to another woman. During a brief affair, Kemal becomes besotted with Füsun, who is hidden away from him by her parents to avoid the shame of the encounter. Kemal spends the following eight years obsessively searching for her and trying to win her love while slowly losing his mind. Meanwhile, his beloved Istanbul is besieged by civil unrest that will leave it forever changed. Throughout his search for Füsun, Kemal hoards anything and everything he can find to remind himself of his beloved: china ornaments from her family home, cigarette butts and hair accessories. “It was to preserve these happy moments for posterity that I collected this multitude of objects large and small, which once felt Füsun’s touch, dating each one to hold it in my memory,” he explains. These items form the basis of the collection of The Museum of Innocence and are presented in 83 enclosed glass dioramas, one for each chapter of the novel. Each copy of the novel includes an entry ticket printed in the closing chapter. When I arrive at the three-storey corner building that houses the museum, supposedly once the home of the fictional Keskins, my book is stamped with a maroon butterfly and I leave the steamy streets of Istanbul to enter into Pamuk’s world. Each floor of the museum represents a different period in the novel, as well as the history of Istanbul during a period of great change. The first thing that catches my eye are the 4213 cigarette butts that are collated, concisely annotated, and pinned to boards like a delicate butterfly collection. These are the remains of cigarettes smoked by Füsun between 1976 and 1984 and collected by Kemal at the height of his obsession. Nine square frames are mounted on the same wall showing looped videos of her hands animatedly smoking and stubbing out cigarettes. It is voyeurism that even Hitchcock would envy. I take the stairs to the first level, passing a display case containing only a gold earring in the shape of a butterfly with the letter F in its centre. It is the earring Füsun lost during the first encounter of the affair. As I view these exhibits, my connection with the novel is immediate. The yellow 1970s bag that Kemal purchased for his fiancé, Sibel, is just as I imagined it. The Meltem soft drink bottles and the poster showing Inge, the German model, both symbols of western influences encroaching on Turkey during the 1970s, are included. The sounds of the streets of Istanbul are recreated – the honking of car horns, the screeching of brakes, the voices of vendors. Each display case brings the scenes I have read to life, reconciling them with my memory and perception until the museum and novel become extensions of one another. I stop on the mezzanine level and flick through my copy of the novel, trying to sort fact from fiction. But it’s ultimately pointless; the stories of the people and the city, the novel and the museum are so closely intertwined that to separate them spoils the experience. 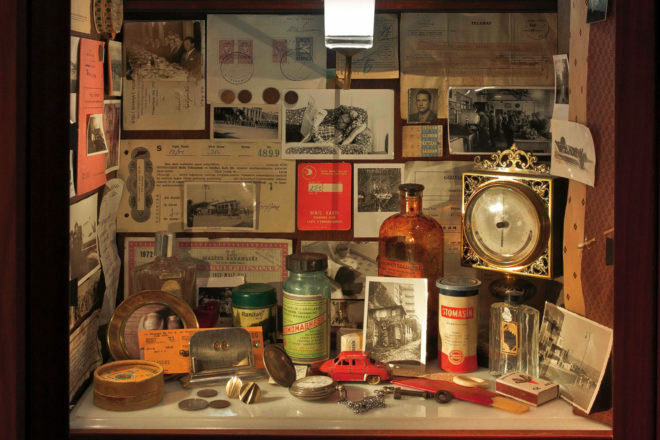 Aside from being a heart-wrenching love story, The Museum of Innocence is a historical window into daily life in Istanbul during a time of social change and political upheaval – Pamuk has referred to himself as “the anthropologist of my own experience”. Visitors do not have to have read the novel to enjoy the museum, but many will no doubt be inspired to pick up a copy in the gift store on the way out. The Museum of Innocence is located at Cukurcuma Caddesi, Dulgic Cikmazi 34425, Beyoglu, Istanbul. $12 for adults and $5 for students. Each copy of The Museum of Innocence includes an entry ticket. Tuesday to Wednesday and Friday to Sunday from 10am until 6pm, and Thursday from 10am until 9pm. I was in istambul two year ago an now I reading the book. And is the thir book by Pamuk I read, I feel wonderful. Thanks for your response! Don’t forget to enter it into the competition via the link above.